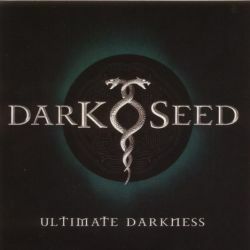 Although Darkseed are part of the more established German gothic acts, I've never heard of them before. This proves either that the German gothic scene is very poor or that I'm not at all interested in this kind of music. Ultimate Darkness is already the seventh release by the German sextet. Already the first notes on this record put the music somewhere between gothic, electronica, dark wave and metal. I can't discover any original moments on this record. Very annoying are the raw vocals that try to sound metal, but in a less convincing way than for instance with Laibach. The vocals are mostly in English, but partly in German, too. Most songs are built upon catchy melodies which become quite repetitive after a while. Sometimes they are so dominant that you get a kind of luna park sound which you otherwise only find in Blümchen or Scooter songs, which isn't a very nice comparison. This is the case for the title track and The Dark One. Good moments are rare on this record. The only exception is Save Me where Darkseed show that they can play on the same level as H.I.M. But in general, it doesn't matter if Darkseed try to play melodic or dark stuff, all that you hear has somehow already been done by other bands before. My review may seem a bit harsh, but gothic metal is in my opinion a genre where there is precious little space for innovation.